Has it really been 8 months since our first baby went home to be with Jesus? That seems crazy. I haven't written about this journey in a while, but when I looked at the calendar and realized today marks 8 months since we lost her, I decided I wanted to document how I'm feeling and where I am with it all. Hopefully this can be an encouragement to anyone walking a similar path. If you don't know the story of Taylor Grace, you can read it here. 8 months later, the emotion is still raw. I actually just read what I wrote on the link in the last sentence and finished with tears in my eyes. I lived through it, but sometimes reliving it, I can't believe it actually happened. I think part of the reason the journey has been so tough is because she had an identity. It's funny, because the first trimester is when you are more likely to miscarry. I was really careful those first 12 weeks and tried not to focus too much on the little human growing inside of me for fear of losing it. Once I passed that first trimester, all bets were off, and I was really going to have a baby, or so I thought. I got to see my body change and bond with the baby inside me, but more than anything, we knew her gender and her name. She had an identity. From that point on, it could never be abstract for me. 8 months later, it still isn't. I can honestly say that not a day has passed where I don't think about our journey or what life would look like had she lived. She would be about 3 months old now, and I see her in friends' babies and the little babies at church. Though I feel like I have experienced every emotion in the book, I am thankful that guilt, anger, and self-hate are excluded from the list. As heartbreaking as it was to lose her, I have never blamed myself or Parker. One of us released two of every chromosome instead of just the one we were supposed to. We don't know for sure who, but based on the ultrasound, it was probably me. I don't blame my body or God for what happened, but I don't think it was a mistake or a "lightning strike" as the doctors called it either. I think God had a plan, and He carried it out. I have friends who have miscarried that blame themselves, and that breaks my heart. I did everything I could to keep our baby alive, and I believe that completely. I remember a friend came over to bring us dinner about 3 days after we lost our baby. She said to me, "I don't know how you are even out of bed", and that stuck with me. When you go through something like this, you have a choice to make. You can let it destroy you or let it strengthen you. It hasn't always been easy. There were days where all I wanted to do was cry. There were times over the holidays where I literally hid in a closet to cry because I just couldn't take it anymore. I got through those days though, and I'll get through any tough days ahead as well. Losing a child will change you life. It changed my life and rocked my world to the core, and it still effects me. Life keeps spinning even when your world stops, and eventually, you figure out how to do life again. I miss that little girl every day, and 8 months going by hasn't changed that, but I still find comfort in the same thing I found comfort in the day she left us. She's with her Creator, and she's waiting for me there. I continually pray for you and Parker, as I cannot even begin to fathom what you both have gone through. And I always love reading your story about it because it shows your heart and it shows just what FAITH can do. Even in the darkest of days, knowing your little girl is with her Creator and waiting for you makes it that much easier to get out of bed instead of blaming yourself and being miserable. Chelsea where you are weak the Lord will be strong. You are a wonderful mama because you allowed Taylor to live out the purpose God had for her short life. You were obedient, redemption will follow. 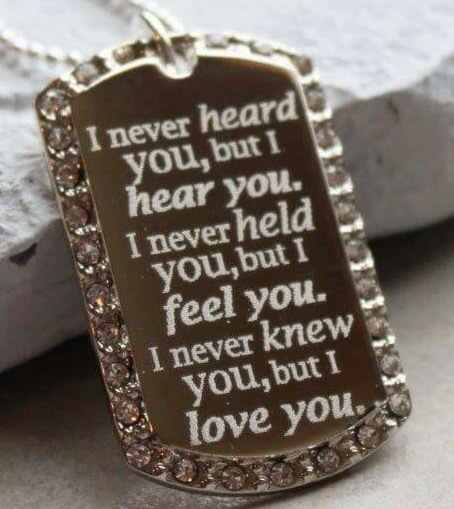 i have no idea what you're feeling, but know that you are so loved. the truth is, when you wrote "You can let it destroy you or let it strengthen you" i gave a hearty amen! you and parker are so loved by God and He is doing something big through you. You are amazing my friend. I always think of you guys and I know that precious Taylor is looking down on you both and is so happy that you are her parents. I was randomly thinking about you and Taylor yesterday but didn't know why... I can't wait until we can all party with Taylor and Jesus in Heaven! I can't wait to meet her. Every time I've read a post about yalls journey with Taylor, all I can think about is how strong you and Parker are as a team! I have a friend who had a still born son over a year ago, and I'm going to be sharing this with her! Hoping she finds a little bit of comfort. This is so beautifully written, thank you for sharing. <3 My heart still breaks for all you went through. I can't even imagine it and I pray for you often! II am thinking about you all and praying for you today. I can't imagine how you must feel but I'm always here if you ever want to talk about Taylor or anything for that matter (which I know you already know). You're the strongest person I know. Love you friend. You're so strong, Chelsea. God has a very special place for His babies that He calls home early. I'm certain of it. I really admire your strength through all this. You are right God had a plan. Whether that was to make you more aware or compassionate or some other reason, He only knows. What we do know is that Taylor touched you, and you are impacting so many others through your story. As always, thank you for sharing your heart.